Greetings everyone! I haven't decided which of the individual challenges I'm going to attempt yet, but wanted to get the party / thread started! keep on rowing, just keep rowing. I am out of town 11 days of January, so it is going to be tough for me to hit any of the challenge goals unless some of the hotels we stay at have an erg and I have any energy left from biking to use it . Will shoot for the lowest one (15 hrs?). Sharky, thank you for starting this thread. Sharky, have you made your choice yet? Last January, swapping from The Haul to The Stretch worked better for you, because it fitted in with work commitments. 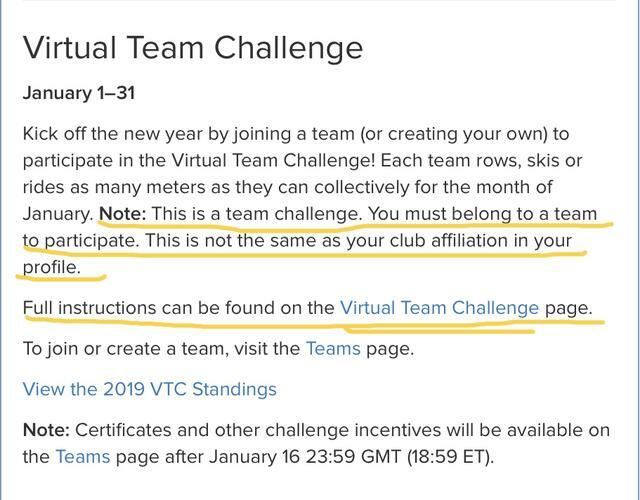 thanks for the info re: virtual challenge. I am signed up and have first meters posted and will work toward 15 hours in January as well, although that is going to take some effort given my travel schedule this month. Doesn't hurt to try! Great to see lots of good posts! Right now I'm signed up for The Haul, but yeah, I'll probably change to The Stretch. I'm going to see where I'm at after this weekend (Jan 5-6) to make my decision. I managed to row after I got back to FL last night, so I just switched to the Stretch. I have exactly 20 days I am home in January, so I figure it will be a lot easier to just row some every day and keep up with my other training vs. trying to row almost an hour/day. Managed to do the CTC (20 min/max 20 SR) today, but can't say I liked it..much prefer a quicker SR and less pull on back. Still deciding between The Haul and The Stretch. Currently set to The Haul. Saturday was a good day with a couple of solid rows. Sunday, not so much. Got one 20 min row and then spent the rest of the day lounging, errands, and getting ready for a full week of work. I think I can come close to the Haul, just not sure I'll be able to make it. I like the flexibility that the Stretch gives me, but it's not as much of a challenge. Decisions, decisions, decisions. I signed up for the Big Stretch. Think I can manage it although I'm doing my first timed 2K on the 18th. I may not want to row after that if it goes poorly. Played 2 hrs of pickle ball and rode an hour on bike (14 miles) and I still need to row today plus I am doing a 7 min strength workout app every day. REALLY glad I switched to the stretch as I have only been managing around 4000 meters/day with my other stuff I do for fitness. Gearing up for our bike trip in 2 weeks! I have been hanging out at the bottom of the board for the CTC's...the interval ones are much easier for me to be competitive in, but at least I am putting up a time each month so far. WOW hard to believe we are already 1/3 through the month of January! Once again I've switched from the Haul to the Stretch. Had a couple of days not go as planned, so I switched. A bit disappointed about that. How is it that I can do 10K (an hour) a day for 25 days for the Mud Season Madness challenge in March, but can't manage just over half of that in January!? Of course I may not make 10K a day this March either. Oh well, guess I've got my first goal for 2020! (Actually second, since I've tentatively earmarked 2020 as the year I go to Boston and participate in the CRASH-Bs) And as the saying goes, I'm lapping everyone that's on the couch. Janet are you getting excited about you're upcoming trip? Almost halfway through stretch (9 days rowed). Still only doing 3-4,000 meters/day, but rowing every day. I find I much prefer 500 meter intervals w/ one minute rest to continuous rows. I guess it is easier to manage mentally. Same reason I do my runs with intervals currently as well. Yes, Sharky, getting excited for our Thailand trip. We have company this week, so I haven't spent much time doing last minute research and early packing, but that will start next week! Trying to keep us both healthy between now and Jan. 22, so we are fit and ready to go . Thanks for asking.